The system of Philippine martial arts known as Cabales Serrada Escrima was founded by Grandmaster Angel Cabales (1917-1991) and first taught publicly in the year 1966 in Stockton, California. Originally GM Cabales’ system consisted mainly of Espada y Daga (Stick and Dagger) techniques, but after opening his school in Stockton, GM Cabales started adding Empty Hand, kicking and other Weapons. In the beginning GM Cabales did not have a name for his close range system which was based on the DeCuerdas style of escrima. It is said that one night an old Filipino man stopped by to observe the class and mentioned that the techniques had many ‘serradas’ meaning that it had many ‘closing in’ movements. Shortly after this event the system had a name. Angel Cabales was born on the island of Panay in the Visayas (central) region of the Philippines. He began his training as a disciple of Felicisimo Dizon who taught him the DeCuerdas style of escrima. DeCuerdas is a close range system that is very difficult to find today. 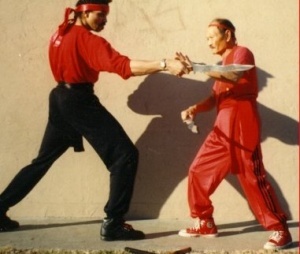 After immigrating to the United States he introduced his unique brand of escrima, and being one of the first to commercially teach the Filipino arts he became known as the “Father of Escrima in America”. Emphasis is placed on footwork, speed, reaction, correct angling, superior position, technique precision, and weapon accuracy. Disarming maneuvers, skills in feinting known as “picking” and methods of countering the adversary’s skills known as “reversing” are essential components of the system. One of the more unique aspects of the art is the use of a shorter than normal stick. Although the art is known to wield sticks in the 18-24 inch range, 20 inches seems to be the standard among many practitioners.While this may seem too short to be effective to many of you, the speed, accuracy and power that can be generated with the shorter weapon is nothing short of amazing. On its surface, this system of escrima seems to be very simple and direct. When viewing an exponent perform the art, its signature movements are executed with swift and decisive grace. However, this simplicity is exactly what is necessary to fully investigate the complex biomechanical movements and tactics of deception at the disposal of an escrimador. Click the Images below to see a video demonstration.